We can all learn from his devotion to Christ and would do well to follow the example he set (1 Cor. 11:1; Phil 3:17; 4:9; 1 Pet. 5:3). With the new year upon us and the pressure to create new resolutions, we encourage you to think sober mindedly about your resolutions. 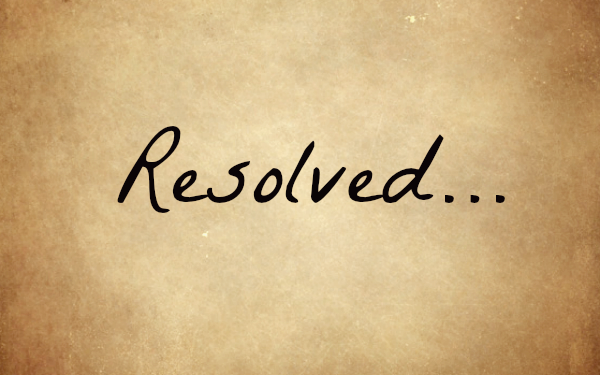 In doing so, look upon the life and resolutions of Jonathan Edwards as an example in living a resolved life for the glory of God. For several months Edwards penned a total of seventy resolutions. As you read through these you may come away with the impression that Edwards was some sort of superhuman. This isn’t the case at all. Edwards was a man like us all. God created him. He was born in sin, but redeemed in Christ. He lived dependent upon the grace of God and the power of the Holy Spirit at work within him to live for and enjoy God. Don’t be discouraged when you read this list. Be encouraged in Christ and be resolved—by the grace of God—each and every single day to look upon him. 42. Resolved, frequently to renew the dedication of myself to God, which was made at my baptism; which I solemnly renewed, when I was received into the communion of the church; and which I have solemnly re-made this 12th day of January, 1722—23. 43. Resolved, never henceforward, till I die, to act as if I were anyway my own, but entirely and altogether God’s, agreeable to what is to be found in Saturday, Jan. 12. 61. Resolved, that I will not give way to that listlessness which I find unbends and relaxes my mind from being fully and fixedly set on religion, whatever excuse I may have for it–that what my listlessness inclines me to do, is best to be done, etc. 64. Resolved, when I find those “groanings which cannot be uttered,” of which the Apostle speaks (Romans 8:26), and those “breakings of soul for the longing it hath,” of which the Psalmist speaks, Psalms 119:20, that I will promote them to the utmost of my power, and that I will not be weary of earnestly endeavoring to vent my desires, nor of the repetitions of such earnestness. This article is shared in full from The Resurgence. Find the original article here.